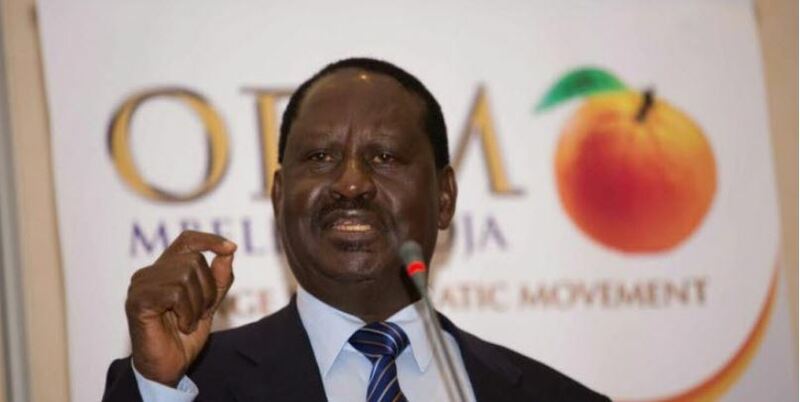 Former Prime Minister Raila Odinga has dismissed increased calls from local politicians to retire from politics and focus on his recent appointment to the African Union Commission as the High Representative for Infrastructure Development in Africa. Speaking on Saturday in his political home ground of Bondo, Siaya County, the Opposition leader told off those calling for his resignation from politics, adding that he is in politics to stay. Raila noted that the AU appointment does not affect his political role. “I accepted the AU job so as to unite African issues. But the base of my operations in the AU is in Nairobi; sometimes I will travel to Addis Baba, Lagos, South Africa, Egypt, but my main base will be in Nairobi so I am going nowhere,” said Odinga. The NASA leader, who was speaking at the burial of former Kenyan envoy to Egypt Mzee William Odhiambo Okelo, called on Kenyan leaders to focus on politics of peace, unity and development. “I want our people to continue with the politics of bringing peace and unity in Kenya,” he said. Raila’s sentiments were echoed by his elder brother Dr. Oburu Oginga who stated that Mr Odinga is a politician by blood and can therefore not retire from politics. “They should not day dream that Raila has retired from politics; Raila cannot retire from politics. He is a politician by blood and he cannot retire. Anybody who wishes him retirement is day dreaming,” he said. Oburu, who is also a Member of the East African Legislative Assembly (EALA), noted that just as their late father Jaramogi Oginga Odinga had struggled for his own political achievements, Mr. Odinga had also fought for the country’s liberation, hence, he is in politics to stay. “Raila is there to stay and he is not a creation of a dynasty; Raila has been detained for more than 8 years struggling for the liberation of this country, and therefore he cannot be a creation of a dynastic background,” said Oburu. On Sunday, Raila held a closed-door meeting with Kisumu Members of County Assembly (MCAs) over the recent leadership wrangles that have rocked the county assembly. The ODM leader is said to have read the riot act to the Kisumu MCAs, urging them to desist from the chaotic scenes which he said were tarnishing his image as the party leader. A source at the meeting confided to Citizen Digital that Mr. Odinga directed the Assembly Speaker Onyago Oloo to bring sanity to the assembly and table a comprehensive report after one year on the status of the House.